This was newsworthy, but search as one might from New York, Brahimi's stakeout was not on the UN live webcast. This is the type of issue worked on by the Free UN Coalition for Access, so @FUNCA_info put the question to the UN in Geneva and a UN spokesperson there, Jens Laerke. A reply came not from Geneva, but New York-based Stephane Dujarric, who has previously defended the turning off of the UN Webcast just as Syria Permanent Representative Bashar Ja'afari began to speak, and the blacking out of a speech by Palestine's negotiation Saib Erekat. 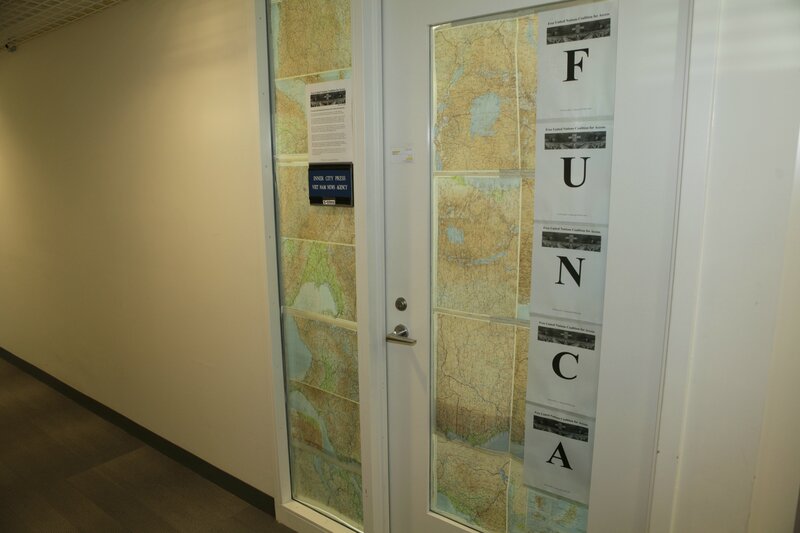 Yesterday, faced with a threat from Dujarric's office to suspend or withdraw Inner City Press' accreditation for merely hanging a Free UN Coalition for Access / FUNCA sign on its office door, Inner City Press published a document showing that the first vice president of the old UNCA, Reuters' Louis Charbonneau, sent Dujarric an internal UNCA document three minutes after it was produced. Here is the article, including audio. Troublingly, Dujarric accepted it on a non-UN email address steph [at] dujarric.com. Is Dujarric an UNCA member? Does UNCA or at least its first vice presidence do intelligence work for the UN? After this improper collusion, what to make of a DPI-UNCA rule being cited to censor or expel Inner City Press for a mere FUNCA sign? Watch this site. Footnote: Things threaten to get worse, including on the webcasting front, at UN headquarters in New York. The UN gave the audio visual contract to “TeamPeople,” which has told existing workers they will be laid off this Friday and a “skeleton crew” kept through August. Does that mean Brahimi has told them Geneva Two won't happen in August, either? Update: after publication, Dujarric replied to @FUNCA_info and Inner City Press, "In as much as we wud like to cover everything live all the time, we just cant. #patience." But why has the audio visual contract been given to a union buster who will go to an even more skeleton crew?